The Ace of Cups joyfully announces the birth or stirrings of emotional, intuitive or spiritual energy. 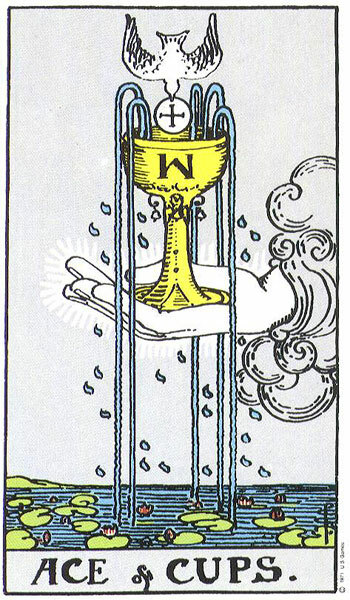 As Cups deal with the emotions, this card can represent the beginning of a new relationship or a new stage within an existing relationship. The Ace of Cups does not just deal with relationships and love even though it is a wonderful card to turn up in a reading when you are hoping to meet someone nice. Often The Ace of Cups simply means feeling happy, content and connected with life and your emotions. If you have gone through a period of difficulty or trying times the appearance of The Ace of Cups in a future position would reassure you that the period of conflict will end and that happier times are indeed on the horizon. If health issues have been a problem and worry, The Ace of Cups appearance would be a very positive sign of a happy return to good health. Everyone wishes you well when this card turns up in a position relating to Surrounding Energy for you are surrounded by love and everyone wishes you well. It is a time for feeling blessed and for counting your many blessings. If a relationship is indicated then there is great potential for happiness. Deep committed love is suggested. In a relationship reading this card speaks for itself and is welcomed by both reader and querant alike. This Ace suggests that powerful positive emotions are welling up within you and that it is safe to release them and share them with the rest of the world. You may be experiencing the first stirrings of love as you are drawn to another. It is safe to open your heart to the experience of it all. You may feel more alive than you have done for some time, even heady with the intensity of it all as your Cup literally “runneth over‟. The Ace of Cups brings great love and a deep spiritual connection with someone. This is not to be confused with casual love. Depending on the surrounding cards The Ace of Cups can often indicate marriage, engagement or pregnancy. The chalice is a feminine symbol and represents the womb, so pregnancy may be suggested, as we see the dove bring life to the vessel. The Ace of Cups can also signal spiritual or psychic development. The Cups people are naturally psychic and intuitive so the presence of the Ace of Cups may simply be highlighting these abilities. The Ace may be asking you to access your natural intuition at this time. You may be interested in developing your skills by attending courses for guidance or are awakening to your spiritual side. The news brought by The Ace of Cups may be in relation to an engagement, wedding, pregnancy, birth, party or any social occasion. In a career reading, a new job or career may be indicated which offers deep fulfilment and a sense of joy in one’s work. The Ace of Cups would suggest a loving and supportive work environment where staff are happy and welcoming. If you are waiting on news of a job application or offer then you are bound not to be disappointed. A job that allows for creative expression would be ideal. The hand holding the Cup cannot contain or hold onto it. For whatever reason this has happened the Cup falls and its contents spill. Emotional loss is suggested in this reversed Ace. Sadness, pain and hurt will definitely be present. Great disappointment and unhappiness is suggested. The love you once had for a person, place or thing has now faded. The Ace of Cups reversed may suggest a relationship that does not get off the ground. You may feel very disillusioned with life or with someone you thought you loved. Instead of feeling blessed you now feel cursed as you find it impossible to hold onto happiness. Disappointment in a relationship is very common when this Ace falls reversed. Love may have has turned cold or is unrequited. Depending on surrounding cards it could indicate a separation or divorce. Perhaps the one you love is not available. The reversed Ace of Cups suggests that one has lost their spiritual connection and feels empty and lacking in love. You may find it impossible to find, hold onto or contain love. It may be that you find it hard to give love. You must ask yourself why? You must also look within and ask honestly if this has happened to you before or if there is a pattern to all your relationships? Do they seem so promising in the early stages only to fizzle out after a period of time? You may be attracted to partners who don’t suit you. You may need to go back to the upright 10 of Cups and take a long hard look at what you want out of a relationship. You may be idealising love too much and so find it hard to find anyone who lives up to your high standards. You may need to come down to earth and realise that no one is perfect. When the reversed Ace of Cups appears, you must ask yourself the following: was the Cup dropped or thrown and by who? If anger was involved, you may need to forgive someone or ask their forgiveness before The Cup will upright itself once more. The reversed Ace of Cups suggest that strong emotional issues are clouding your judgement. Prolonged sadness and bitterness will eventually lead to depression making you feel drained and empty. Do not allow this experience to close down your heart. Be open to forgiveness. Over-indulgence in food and drink may have you feeling emotionally low and vulnerable. 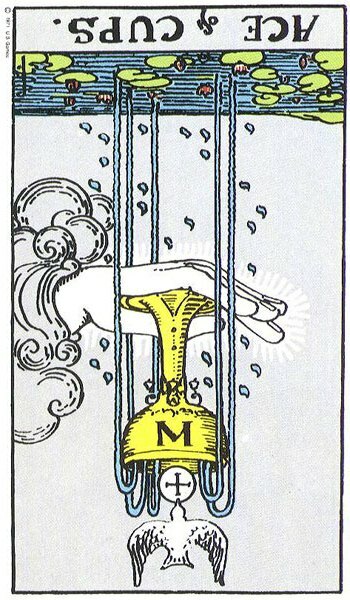 However, you may be attempting to turn away from addictions such as alcohol and The Ace of Cups Reversed sees you pouring the drink down the drain. You have had enough. You may be looking back to the Upright 10 of Cups and realise that you have a lot to live for and many blessings. Your family may have been effected if overindulgence or excess has been involved. There may be deep longstanding emotional issues surrounding your addictions that need to be addressed. As the chalice symbolically represents the womb, there may be a suggestion of female problems There could be possible difficulties with a pregnancy going to full-term. Miscarriages can be represented by the reversed Ace of Cups reversed. When The Ace of Cups reverses, news may be of a breaking-up letter/call/email/text, broken engagement, divorce, miscarriage, cancellation of weddings or any social occasion. There may be those around you who feign happiness for you or who wish you ill.
On a spiritual and psychic level, you may not be accessing your intuition and relying to heavily on logic to sort things out. Developing psychic abilities may be causing sleep disturbances and powerful dreams. Spiritually you may feel lost or let down by your faith. Career related the Reversed Ace of Cups can suggest a job that offers no fulfilment for you. You may be unhappy with your career choice or your work may be uninspiring. You may receive bad news regarding a job application which you had built up your hopes on getting. Your work environment may be hostile and upsetting. The Ace of Cups Reversed can highlight the dilemma of a job or career that was once enjoyable but now brings unhappiness and boredom. What has happened to have brought this about? Can the Cup be put upright again or is it too late? However, you may be guilty of burning the candle at both ends and as a result find work tiring and draining. Your creative side may be neglected in the job you are in and this is bound to lead to inner unhappiness. You must find an outlet for your natural inner talents and abilities.